I will admit I had very low expectations for Resistance when it was announced and the lack of marketing until a month before the premiere didn’t help. The first teaser made it look like a largely superfluous racing show and I watched the first episode more to keep up with Canon then out of excitement for the show. I’m very glad I did however and the show has been a very pleasant surprise! While the initial episodes were a bit shaky as the show found its footing, it rapidly found its stride. The main plot kicked into gear in the fourth episode and the show never looked back. 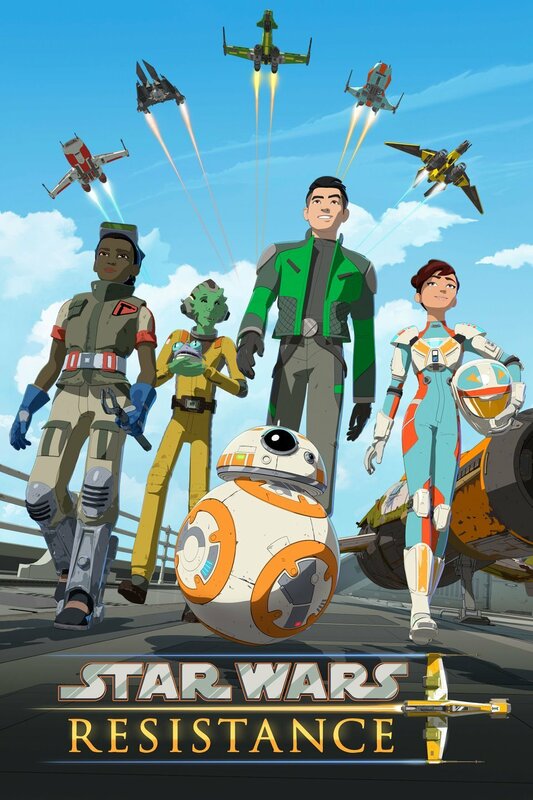 What follows is perhaps the best first season for a Star Wars animated show to date. The characters are memorable and relatable (although if there’s a knock against the show, it’s trying to juggle too many characters) and the setting provides an excellent backdrop for adding to the story fabric. Despite the title, the show isn’t about the Resistance we see in the films. The main character, Kaz, hails from a rich family and has basically had everything set out for him. Acutely aware that his life decisions have all been made for him, Kaz feels an intense urge to prove he can blaze his own path. While spying isn’t quite what Kaz had in mind, he still jumps at the chance to help the Resistance. On Castillon, he faces the challenges of a life without the comforts he’s accustomed to, the station’s seedy population and learning what the First Order is up to while trying to remain inconspicuous. Although Kaz goes on a few excursions when Poe comes into town, the show mostly takes place on and around the Colossus. Thus we get to know the station and its denizens intimately throughout the season. For a franchise that is known for its diverse locations, staying in place works surprisingly well. We’re able to see how people who don’t have ready access to a ship live their day to day lives and the challenges they face. We also get a close look at the lower ranks of the First Order military and its operations. The narrower focus becomes a core strength as the show explores what it means to be a member of a community. Kaz himself goes from a fish out of water, more interested in spying than fitting in, to willing to risk everything for the freedom and lives of his friends and neighbors on the Colossus. He’s starts out almost unbearably klutzy and naive, but steadily improves over the course of the season (although still klutzy, and never hand him a blaster). By the end, you can’t help but root for him as he takes a massive emotional blow and still manages to lead the expulsion of the First Order. Alas, his actions come at the cost of alienating Tam which results in her joining the First Order. Although the story’s choice to have her join the FO is controversial, I feel it was the right one. Throughout the show, Tam only wanted to do her job and live her life. Her boss not only brings in a completely inept mechanic, making Tam’s job harder, but seems to turn a blind eye to Kaz’s bizarre behavior. Not only had she been repeatedly lied to by someone she trusted, but her life and livelihood were put at risk without her knowledge. It’s hardly surprising she took the offer to pursue her dreams instead of staying with people who betrayed her trust. Tam’s decision brings us to a defining theme of Star Wars: the importance of moral choice. Where Kaz inspires others to take a stand against tyranny, others are drawn by the promise of security and are willing to trade their freedom for it while turning a blind eye to its deprivations. When the Tehar kids tell Tam about what the First Order did to their village, she reacts in disbelief and her moral ambivalence all too easily leads to her siding with oppression. This brings us to the point of Resistance: it’s not about the Resistance, but resistance. Aside from Poe and the occasional message from Leia, the Resistance is an ephemeral and distant friend when the First Order puts its boots on the Colossus. It is up to those living in the Order’s shadow to stand together and fight back as the hope for outside assistance is a forlorn one. Will Tam realize her error or become a true believer in the First Order? Tam showed some sympathies towards the First Order’s stated ideals, but was far from a full fledged supporter. She joined less out of conviction than feeling as though she had nowhere else to go after her friends betrayed her trust. How did the Colossus end up on Castillon, what was its original purpose and what is Doza’s history with it? The First Order obviously knew what the Colossus was and considered it a prize worth taking or at least denying to anyone else. Doza was once a Captain in the Imperial Navy and is obviously keeping secrets. How will the people on the Colossus react when they learn they’re no longer on Castillon? The Colossus was home to quite a few people who made their living off the station’s status as a refueling and rest stop. It’s not difficult to imagine quite a few will be less than thrilled to learn their livelihoods are gone. Will the pirates find a place on the Colossus? Just a few months ago the pirates were raiding the Colossus and kidnapped Captain Doza’s daughter. Asking people to sweep all that under the rug just because they helped drive off the First Order is a bit much. What’s up with Tehar and the kids? While the show implied the villagers on Tehar were wiped out for witnessing the First Order’s attempts to core planets, the timeline doesn’t make a lot of sense. In the very first episode we see a completed Starkiller while the kids appear on the Colossus in the fifth episode. They imply they went directly to Castillon from Tehar and the First Order’s alert seems to have just been issued. Did the village somehow get overlooked when they were drilling? Did it appear later? Why did Kylo Ren personally see to its destruction? Eila at the very least appears to be Force sensitive and there are some hints her brother, Kel, is as well. They carry what appears to be a religious symbol of some kind, is there a connection to their village’s destruction? Does Torra sleep in her flight-suit? Seriously, she wears it even when she’s lounging around in her bed and playing video games. Next Next post: You Won’t Believe these Theories About Episode IX!! !